Interior Designer Nicholas Pentecost renovates a country retreat for himself and his partner, filling it with treasures collected through the years. The couple brought the screen behind the bed from their New York apartment. The quilts are antique. The lamps on the bedside tables were a gift from Albert Hadley for their former Bridgehampton house. The dining room opens up off the left of the central stair hall. Atop the dining table is a model of Trajan’s Column, another highlight of Pentecost’s collection. Adding a modern note to the classics here are chairs from Bielecky Brothers. Against the wall is an Italian console, circa 1800. The English Wing chair—Pentecost calls it “quirky”—is from Amy Perlin Antiques. 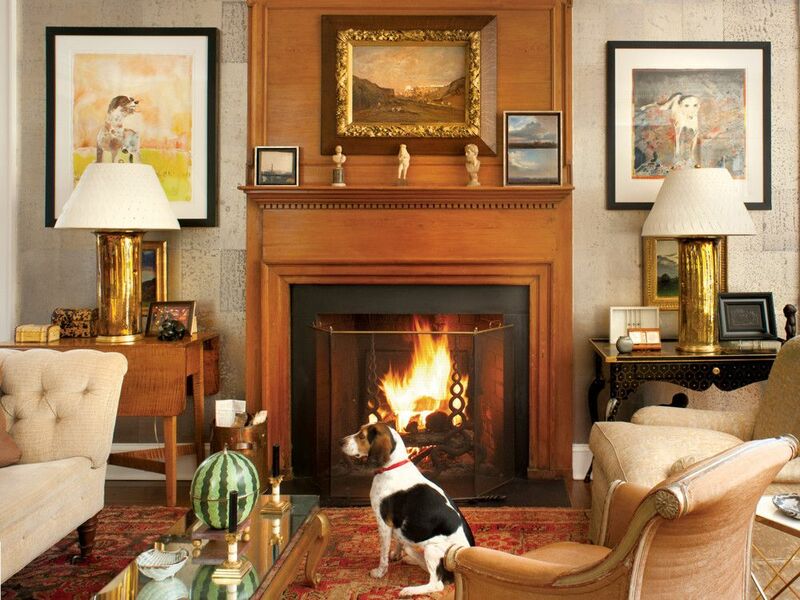 Flanking the fireplace are two dog paintings by Robert Andrew Parker; the little mirrored-top coffee table is Jansen and the andirons, purchased in LA, are by Tony Duquette, purportedly for the Warner Estate. Left: The front of Pentecost’s house, with the original saltbox to the left of the front door and the living room addition from 1965 to the right. Right: The pair's beagle, Baby. Left: An early 19th-century Italian console with a faux porphyry top supports a copy of a Kazimir Malevich sculpture purchased at the Guggenheim Bilbao. Hanging above are a 17th-century Italian painting of a tiger and an interior from Herculaneum. Right: The living room’s Chinese tea paper wallcovering changes subtly with the light. The couple’s collection of canine portraits includes this riveting Belgian painting of a pointer; reproduction Giacometti lamps are castings from the Rockefeller collection; a Fortuny fabric covers the large lounge chair. A top-to-bottom gut renovation created a classic floor plan with rooms flowing off a central hall. In the living room, Pentecost’s love of the classical, the neoclassical, and the modern are everywhere apparent. Hanging over a French Napoleon III table is an Italian antique picture frame used for a mirror; below, one of Pentecost’s collection of architectural models. Imagination? Second sight? Interior vision? Great designers have all three, plus the serious practical smarts and directed will necessary to turn a beautiful idea into built reality. Nicholas Pentecost qualifies brilliantly on all counts. The Parish-Hadley alum's Connecticut country house makes that clear. When Pentecost and his partner originally saw the place, it didn't make the grade due to an off-kilter floor plan, warrens of little rooms on both levels, and a tunnel-like stair. At its core was a turn-of-the-20th-century saltbox, engulfed by two wings added sometime in the 1960s. "The kitchen," says Pentecost, "was a GE Kitchen of Tomorrow from the 1950s, with a service porch jumble adjacent." Circumstances later led the couple back to the house, which is when they decided to make it what they wanted. The gut renovation yielded a beautifully balanced new floor plan with expansive, light-filled rooms that flow naturally off a formal central hall. Pentecost says he tried to imbue the reimagined residence with a 1920s sensibility, as that era sets a very high standard of graciousness for American residential architecture. A fan of the classical and the neoclassical with a bent for the unusual, Pentecost has filled the rooms with a life's worth of collecting in the Grand Tour mode-plus some great, cushy upholstery and some 20th-century surprises. Antiquities or replicas thereof, 19th-century furniture, architectural models, Chinese porcelains, dog paintings, books, and so much more animate walls and tabletops. Everywhere the eye travels, it alights on something of beauty, arresting interest, and delight. Pentecost plays bridge in this corner of the library at a 19th-century Italian table surrounded by painted chairs from their former house. With so much artwork, Pentecost felt it right to use a neutral palette, about which he quotes Albert Hadley: "There are many colors in beige." Nods to Mr. Hadley reverberate elsewhere, in the living room's tea papered walls, which have a subtle gold glimmer, and its red rug-"a statement," says Pentecost. There is also the pair's red library, the master bedroom's sauvage patterns and the bedside lamps, a house-warming present from Mr. Hadley for their Bridgehampton place thirty years ago. The process of reinvention spanned a decade, but it certainly proved two points. The first? As Pentecost says, sometimes the second choice turns out to be the best choice. The second? That the first only turns out to be true in the hands of a great designer.